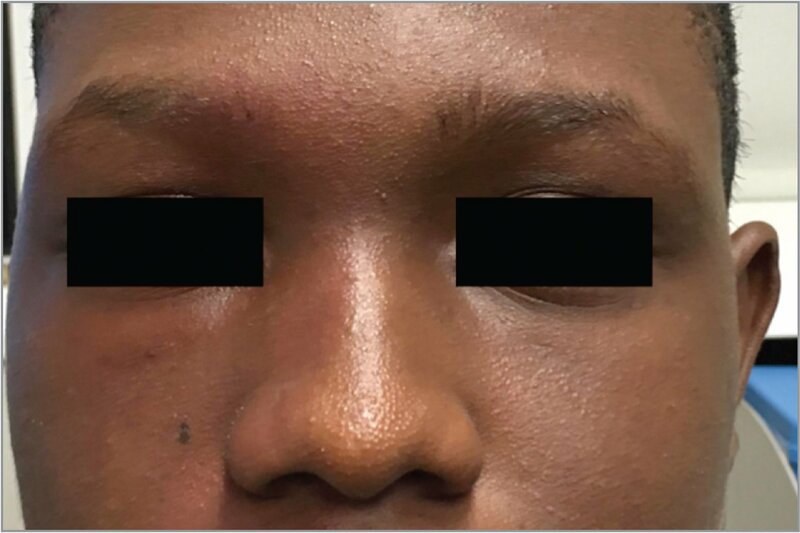 A black teenager presented with long-standing vision loss in his right eye. Clinical exam revealed increased conjunctival vascularity and total exudative retinal detachment of the right eye. 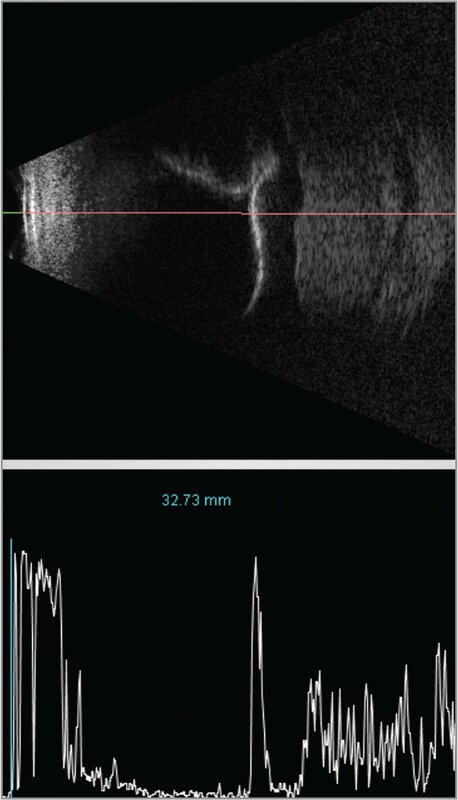 Ultrasound imaging demonstrated a choroidal mass with moderate-to-high reflectivity consistent with a choroidal hemangioma. A closer external examination demonstrated a subtle reddish hue of the eyelids and cheek, consistent with a nevus flammeus. MRI of the brain revealed a T2 enhancing vascular mass. Collectively, these findings were consistent with Sturge-Weber Syndrome. This case highlights the need for a high degree of suspicion for Sturge-Weber Syndrome in dark-skinned individuals that can otherwise mask the nevus flammeus. Physical exam findings and radiographic evidence can be used to guide the diagnosis. Encephalotrigeminal angiomatosis, also known as Sturge-Weber Syndrome, is a congenital, non-hereditary phacomatosis. It usually, but not always, involves the skin with a classic nevus flammeus or port wine stain. Other sites of involvement include the central nervous system with leptomeningeal hemangiomas and the eye with conjunctival, episcleral, and / or diffuse choroidal hemangiomas. Herein, we present a black American patient with long-standing visual loss, exudative retinal detachment, and a choroidal tumor found to have Sturge-Weber Syndrome. The classic nevus flammeus was hidden by the patient's darkly pigmented skin. We present this case in order to highlight the difficulty in diagnosing this disease when the cutaneous nevus flammeus is subtle. This research conforms to the Health Insurance Portability and Privacy Act of 1996 and the Tenets of Helsinki. It was submitted to the institutional review board and ethics committees of The New York Eye Cancer Center. A black male teenager presented with a history of long-standing vision loss in his right eye. He had no past medical or surgical history and denied trauma. Visual acuity was light perception in the right eye and 20/20 in the left eye. A right afferent pupillary defect and symmetrically normal intraocular pressures at 14 mm Hg were noted. 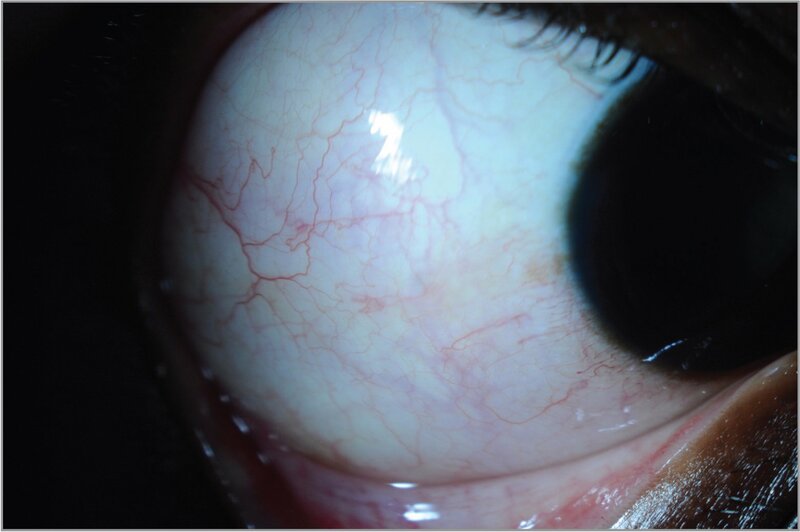 Slit-lamp examination revealed no iridocyclitis or iris neovascularization. There was a slight right posterior sub-capsular cataract. Funduscopic examination of the right eye revealed a bullous, non-rhegmatogenous retinal detachment (Figure 1). B-scan ultrasonography demonstrated a highly reflective detached retina that obscured a moderately reflective, dome-shaped choroidal tumor without extrascleral extension (Figure 2). Color fundus photograph of the right eye demonstrating a large inferior retinal detachment. Intraretinal exudate was noted. B-scan and A-scan ultrasonography of the right eye demonstrating the highly reflective retina detached over the moderately reflective choroidal tumor. On closer external examination, the patient was noted to have right-sided facial fullness and increased conjunctival vascularity. There was a subtle reddish hue of the eyelids and cheek, consistent with a nevus flammeus (Figures 3 and 4). Given the above findings, a clinical diagnosis of choroidal hemangioma associated with Sturge-Weber Syndrome was suspected. Anterior segment photograph of the right eye demonstrating mild, perilimbal vascular tortuosity, mild conjunctival hyperemia, and diffuse pink episcleral vascular congestion. External photograph demonstrating slight facial asymmetry and a faint nevus flammeus on the right side. Because of the patient's pigmentation, this was particularly difficult to appreciate on routine examination. Magnetic resonance imaging (MRI) of his brain and orbits with and without contrast confirmed a right retinal detachment with a T2-enhancing vascular mass and no leptomeningeal abnormalities. Positron emission tomography / computed tomography (PET/CT) revealed slightly asymmetric metabolic activity (Standard Uptake Value of 2.9 in the right eye versus 1.9 in the left) and no evidence of metastasis or systemic malignancy. The relative risks of observation, low-dose (20 Gy) external beam radiation therapy, and retinal detachment repair were discussed with the patient and the family. Given the poor visual prognosis and the possible risk of secondary radiation oncogenesis, the patient and family members opted for observation. Follow-up 1 year later demonstrated no change in vision or tumor size. In any patient presenting with a choroidal lesion, the differential diagnosis includes infectious, inflammatory, vascular, benign, or malignant eye tumors. A constellation of multimodal imaging findings can help distinguish choroidal hemangiomas, including coarse early choroidal filling on fluorescein angiography, increased choroidal thickness and vascularity with variable subretinal exudative and degenerative changes best seen on optical coherence tomography, and moderate-to-high reflectivity within a dome-shaped mass on ultrasonography.5 Given the total retinal detachment in our patient, we were highly reliant on the ultrasound characteristics of the choroidal lesion to narrow our differential diagnosis. In this case, the nevus flammeus was particularly difficult to see because of the patient's natural pigmentation. Trese and Trese previously reported on the difficulty of diagnosing Sturge-Weber Syndrome in a black patient because of the absence of the obvious nevus flammeus despite extensive examination.6 In their case, it was only after radiographic imaging revealed choroidal hemangioma and neurological arteriovenous malformations did clinical observation reveal the presence of a congenital facial “birthmark” on their patient. Sturge-Weber Syndrome-associated cutaneous nevus flameous is typically easy to see in lightly pigmented patients. However, this diagnostic finding can be difficult to see in black patients. This case demonstrates the importance of considering this diagnosis when darkly pigmented patients present with a non-uveitic, non-rhegmatogenous retinal detachment secondary to a diffuse choroidal hemangioma. Clearly, an early diagnosis of Sturge-Weber Syndrome allows for early monitoring, glaucoma treatment, and early intervention for Sturge-Weber Syndrome complications, including exudative retinal detachment.3 Finally, it is important to educate patients about the potential benefits and risks of treatment, as well as incorporate patient goals in order identify the best treatment option for each individual patient. Sullivan TJ, Clarke MP, Morin JD. The ocular manifestations of the Sturge-Weber syndrome. J Pediatr Ophthalmol Strabismus. 1992;29(6):349–356. 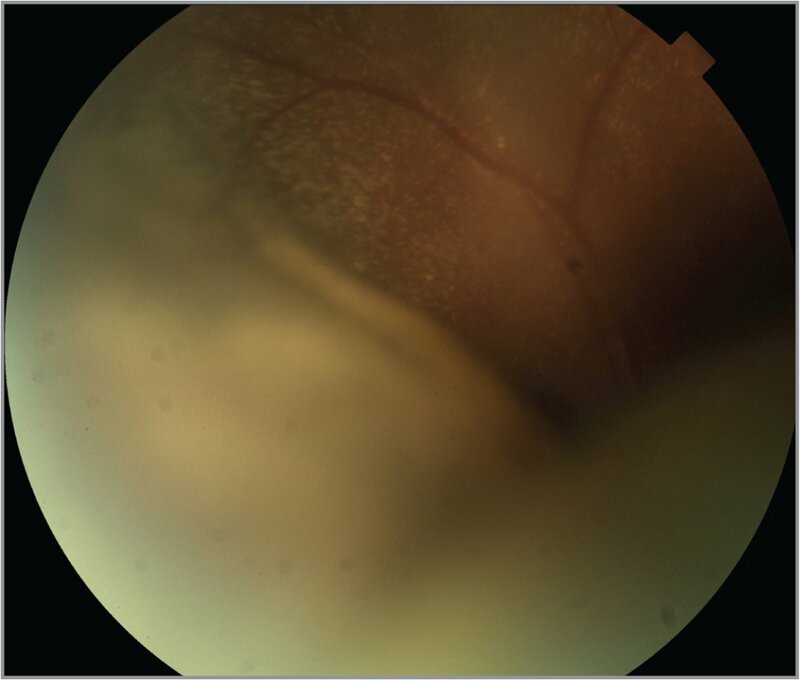 Mantelli F, Bruscolini A, La Cava M, Abdolrahimzadeh S, Lambiase A. Ocular manifestations of Sturge-Weber syndrome: Pathogenesis, diagnosis, and management. Clin Ophthalmol. 2016;10:871–878. From the Department of Ophthalmology, New York University, New York (SS, ET, NM, YSM, PTF); and the Department of Ophthalmic Oncology, The New York Eye Cancer Center, New York (PTF). Dr. Modi is a consultant for Genentech, Novartis, Allergan, and Alimera Sciences. The remaining authors report no relevant financial disclosures. Address correspondence to Paul T. Finger, MD, The New York Eye Cancer Center, 5th Floor, 115 East 61st Street, New York, NY 10065; email: pfinger@eyecancer.com.